Most of us are aware by now about the popularity of pork dishes in Nagaland. You will find varieties of it in its many forms – smoked, fresh, cooked with bamboo shoot, axone (fermented soya beans) or pickled! Walk around Nagaland, and you will find meat pickles sold in almost every neighborhood shop [You can even buy them online on our shop]. Worthy to note that the locals residing outside the state, never misses to pack these pickles to take with them whenever they visit home. You can eat them with rice, sprinkle some over your favorite ramen or just eat it as a snack. No wonder it is the most favored meat item in Nagaland. 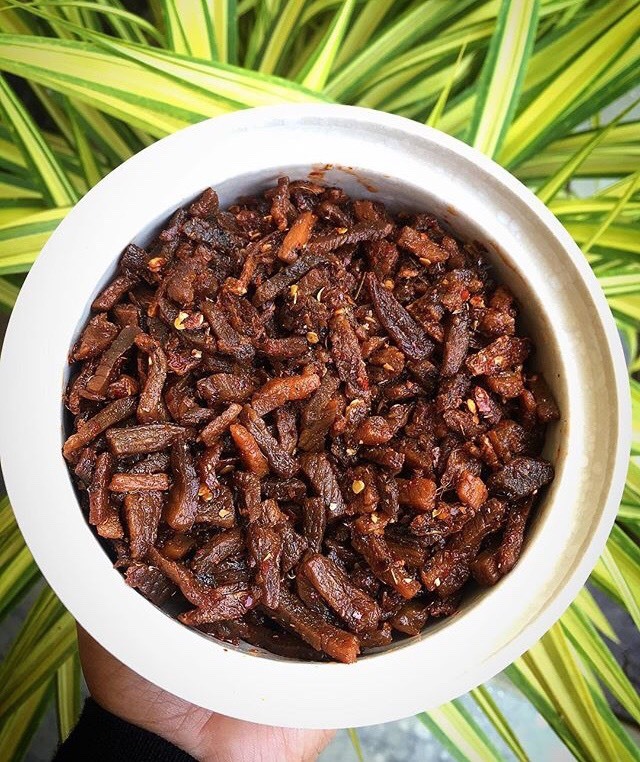 So today, our contributor Lilia Jimomi from Nagaland is here to show us how to make the easiest naga pork pickle using simple ingredients. Let’s find out how! For those who would rather buy than make, you can buy meat pickles on our shop HERE. The recipe of Naga’s Famous Pork Pickle, contributed by Lilia Jimomi from Dimapur, Nagaland. The recipe of Naga’s Famous yummy Pork Pickle, contributed by Lilia Jimomi from Dimapur, Nagaland. 1 kg of boneless pork with very little or no fats. Wash the pork thoroughly and cut it into 4 -5 chunks. Add salt, 2 cups of water and pre-cook for 20 mins. Meat should be tender and not overcooked. Drain the stock, let the meat cool down and cut it into small sizes (or desired shape). Spread it on a large plate and let it dry. Heat the oil in a pan, add coarsely minced ginger and garlic and sauté well until it turns golden brown. Add meat, Naga king chilies (depending on how spicy you want) and lower the flame. Stir once in a while to avoid burning. Once the meat is well cooked, cook in high flame for few minutes to make it slightly crispy and golden brown in color. Spicy and yummy Naga Pork pickle is ready! 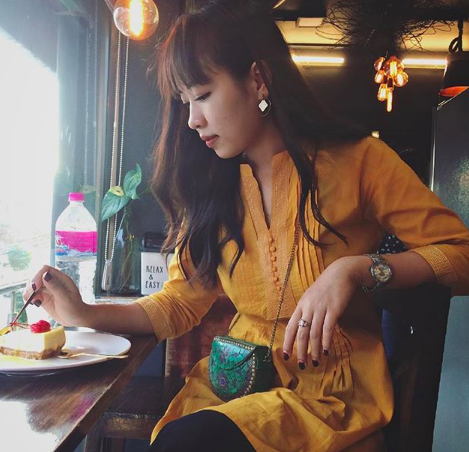 Next PostMeet The Sisters Behind Crochet Doll Venture “Handmade Cottage” from Manipur.